Apple's announcement that iOS 9 would include ad-blocking and tracker-blocking as a system level feature is widely expected to shake up the mobile advertising industry when iOS 9 ships later this year, but few seem to realize that the new blocking features are already having an impact. I was reading a post today on Charles Arthur's personal blog, The Overspill. Arthur writes for The Guardian and other august publications, but today he wrote on his blog how the ad blocking revolution was going to change everything. While I generally agree that the impact will be revolutionary, I also think that the revolution has already begun. I have seen more discussion of the negative impact of adverts on web browsing in the past four months than I had seen in the previous four years. What used to a niche topic discussed on sites where web publishers congregate is now hotly debated across the tech blogosphere. Digiday, for example, informed us a couple weeks ago that the Washington Post has cut its side loading time by as much as 85%. No one other than a few techies used to care details like about that, but now we're all talking about it. You didn't used to see leading link blogs like Daring Fireball comment favorably when iOS developers analyzed how adverts and trackers create a poor user experience on popular news sites like iMore, nor would you have expected the site in question to admit the truth of the analysis. Similarly, I don't know the last time that a major news site like The Verge has been called out for grousing about the mobile browsing experience when in fact that site had admitted two months before that it was one of the reasons why that expereince is so bad. And who would expect a VC finance site like VentureBeat to show interest in a study that showed that blocking adverts cut network traffic. There's also increased interest from sites like Digiday and Business Insider on how publishers are fighting back against ad blockers by blocking the blockers or trying to circumvent the blocks, and every month there are new editorials calling ad blocking immoral, or at least a bad move (*). This, folks, is the revolution in action. Change is already happening, and I would predict that by the time iOS 9 finally launches it will be the coup de grace, and not the coup d'etat that some are expecting. iOS9 could be the straw that breaks the camel's back, but I don't see it as a ticking time bomb. P.S. Isn't it curious how so many response can be mapped on to the five stages of grief? Those who protest the coming change are in the first or second stage (anger or denial). Charles Arthur and I, on the other hand, have moved on to the fifth stage (acceptance). I definitely block ads… have for years. Originally, I started for security/privacy reasons, but quickly discovered how much more *usable* the web is without ads. For what it’s worth, I whitelist ads on sites that I support (as long as the ads aren’t egregious or annoying (quick rule of thumb: if it moves, makes a sound, blocks content for any period of time, or in some cases, merely distracts from the site’s content by using garish colors or images, it’s annoying). Thanks! That would bug me too, especially at the beginning of the post. As a user I’d rather not see ads, but as a site owner, in which a healthy chunk of my income comes from ads, this is going to be a frustrating time. Would this eventually reduce the usefulness of the web? Most website owners are able to invest as much time as they do because it either heavily supports, or is all of their income. If that income disappears, then they could too. We may even see many useful and interesting sites abandoned or even shutdown…at least the small and mid-sized efforts. Sounds grim I know, but what if? Your site has never seemed like a problem, ad wise. I don’t use a blocker, I simply stop going to sites that are too buggy. The really bad issue with advertising isn’t that page load times reach for the moon or page sizes are hitting 2megabytes for 1-5K of content. It’s the fact that most advertising is served by a maze of third and more parties who take NO legal or financial responsibility for the content of advertising, which may include malware and drive-by downloads which can do enormous damage to a machine’s security. I don’t find advertising objectionable per se. But I block advertising because my home machine has my personal information on it . And at work, getting something off the web, even inadvertently, that could compromise my work machine’s security could cost me my job. When advertising can be reliably traced back to the source, and civil or criminal legal action can be taken against those who serve up malware, let me know and I’ll think about whitelisting sites. I am reading this on my Nexus 7 tablet using Firefox with ublock installed. We have a wireless broadband connection and web surfing on my tablet was painfully slow previously. Now it’s fairly pleasant. I still haven’t figured out how to whitelist a site on my tablet. I run ads on my own site, but also use an ad blocker (though whitelist some sites). Granted, I’m not making much cash (pennies at best) on my site’s ads. I mostly use an ad blocker to block the more annoying online ads (anything that moves or plays video/audio), plus YouTube’s pre-video ads. Seeing political ads, especially ones for candidates/positions I dislike, made me grow fed up and opt to ad-block YouTube. About your site, I actually disabled uBlock for you when I first started to read here daily, but then your blog offered me some beautiful half-naked Filipono chicks, and then there were adblock again. Publisher should also be able to blacklist some types (however unsuitable, maybe genre would be a more understandable term) of ads. If I want to see some half-naked girls, I know where to go to. Where was the advert that showed you the half-naked chick, and how big was the ad? I ask because it could have come from one of two sources, and I need to know hwo to yell at. 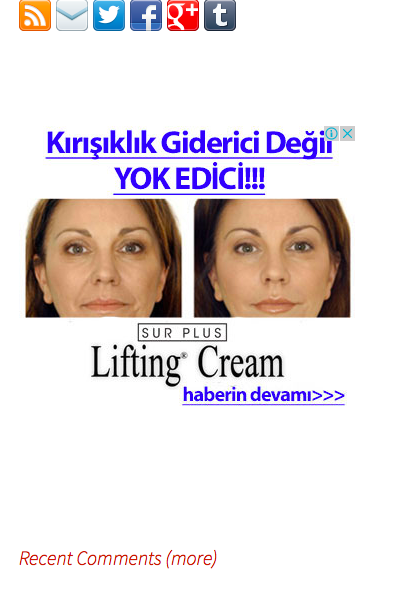 So I told ublock to whitelist this site, but I am not seeing any ads. Is this a bug with ublock or are there not any ads at present? This site has ads on it. What are you using besides uBlock? I have found that some extensions like Ghostery will also block ads. I wish someone would figure out how to disable autoplay on HTML5 sites because it’s driving me effing crazy. I’ll take ads over forced autoplay. Very much yes. There are a couple sites I will no longer visit because of their autoplay videos. There are a few ad blocking options for iOS, but this is the only that I know of that works on cellular. I white listed this site in Ghostery and now I am seeing the ads. I’m a millennial and like all millennials I was born with a deep-rooted set of expectations for what life should offer me. First and foremost: I expect free sh!t. That, and I expect to not work very hard. The list of things I expect for free includes free websites. Yes, I block ads. I’d like to personally thank all the writers who work so hard for free, day-in-and-day-out and don’t make a dime off me. Thanks for writing this article. Are there ads on this site? Don’t answer. I don’t care. I’m just here for the stuff I deserve… which is everything. Yay, free stuff. This is the way the world should be. I like this site though. Can you…like… get back to work and write some more stuff… for me?